In Cricket, recording the live cricket scores is an important craft. It requires concentration, keeping eye on every ball, Umpire signal and record them in score sheet. For all content mentioned below, credit goes to New Zealand cricket Umpires and scorers association. This information is for education purpose and non commercial use . 1. Desk and chair suitable for scoring, 2. Shelter from the sun/ wind / rain if scoring outdoors, 3. Team line up , 4. Watch to record inning start/end, batsman in, out time. A typical cricket score sheet is shown below. There are different versions with more contents however basic information will remain same. For better clarity, lets divide below score sheet into 7 categories. Batting Line up: Input name of batsman as per batting order. Bowling details: To be filled in for every ball bowled. Overs and runs: To be filled in after completion of each over. Sign off : Take sign of Umpires , captains and scorers to approve the score sheet at the end of the match. 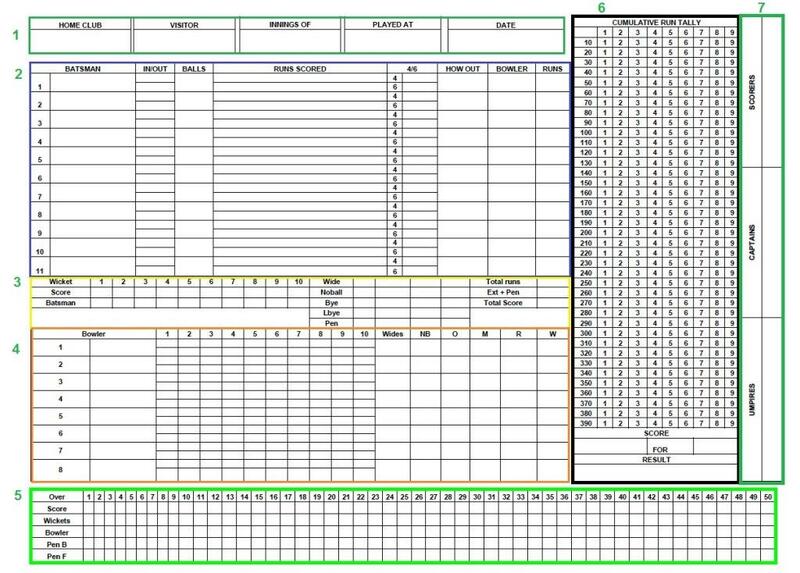 Umpiring signals and Score sheet input scenarios are shown below. I hope above information is clear to input details in the score sheet.